After many years spent on studying the natural medicines, both the herbalists and the doctors agree that garlic is one of the healthiest remedies, because it has many benefits for our health. The garlic is used as an excellent natural remedy almost in all the countries around the world. Nevertheless, many people do not eat garlic at all because of the bad smell that remains after the consumption of raw garlic. Some tend to eat it only during the weekend when they are at home, but most people avoid eating it even then. They even change their mind about trying some delicious tzatziki that includes garlic, because of the fear that people might judge them for the characteristic odor caused by garlic. Garlic is healthiest when it is raw and if it`s chopped and crushed several minutes before consumption. And left like that on the air in order for it to create the corresponding chemical elements primary allicin. The garlic prepared like this is healthy but at the same time creates maximum unpleasant odor. You will have to find smaller garlic. After the invasion of Chinese garlic started in our markets, many people have tried to plant garlic in their gardens. The Chinese garlic has large heads and cloves and what is most important, it can be easily peeled. However, those who consume it raw soon became aware that this garlic makes them feel sick and cause them some gastric problems. Unlike the Chinese garlic the garlic planted in our garden, especially if it is an old variety, has twice smaller head with very little cloves which are difficult to peel. Many of the people who started planting garlic soon gave up. But, that`s a huge mistake. Although it`s small and difficult to peel the this garlic is far healthier and do not cause any stomach problems. 1. Provide small garlic like this. 2. Take the head between your palms and rub roughly. After that take them out of the water and very carefully with your fingers peel the thin shell. 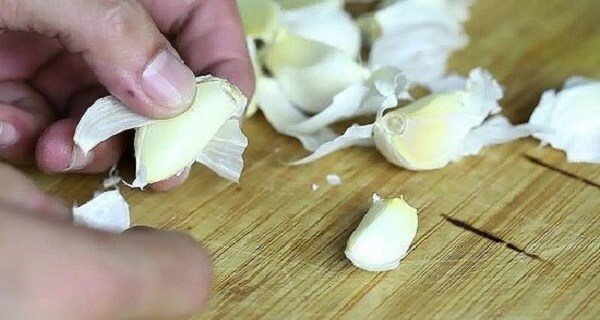 You will easily peel the wet and humid garlic. Do not use a knife!! It is really important not to damage or cut the cloves. Only the undamaged garlic won`t cause unpleasant odor in your body. After you have made this drink the garlics with a glass of water as if you were drinking tablets or capsules. That’s the way it is important the cloves to be in the same size as capsules. Do this on an empty stomach at least 45 minutes before breakfast. If you consume the onion in this way, you won`t have problems with the unpleasant odor, the onion will dissolve in your body and you will get the greatest part of its beneficial components. Not only that the odor won`t appear during the day, but the same will happen the following day. If you`re not sure about the procedure you can easily check it by asking people around you whether they can feel the unpleasant odor of garlic. It is important to remember that the cloves should not be cut or damaged by peeling. We recommend you to consume the garlic in this way, everyday and in a short period of time you will notice the improvement of your health and life. One or two small cloves garlic every day will be enough, and you can consume it in any period of the day depending on your lifestyle.